HELP! Can our adopted feral cat adapt to new neighborhood?? Hello All! 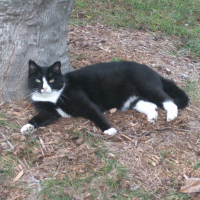 We adopted a feral cat, Oreo, 5 years ago when he fell out of a tree as a young cat in the backyard of our new home. Over time, he progressed from timidly coming onto our front porch to eat tuna, to sleeping at the foot of our bed. :) He is a total tomboy and primarily outside cat, coming mostly to eat and occasionally hang out when the weather is either very hot or very cold. He is also 100% the neighborhood cat - so much so that one neighbor thought he was a stray (no collar as he is an avid tree climber) and also started feeding him and even bought him a cat bed! Here is our dilemma - we are moving in a month and a half. We want to take him with us, but given that he is an outside cat and grew up in the neighborhood - we're worried what might happen if he was relocated. Is this the kind of thing where he would learn his new surroundings and continue going in and out of our new house (but always come back)? I know that the neighbors in our current neighborhood would take care of him - and truly, he can take care of himself, but we would rather he come with us if at all possible. Any thoughts or advice would be much appreciated!